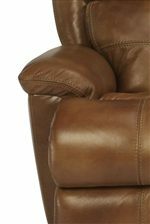 A detailed cushion back, generous seat depth and over stuffed armrests confirm that the Cruise Control power recliner is brimming with comfort and and an aura of warmth. This contemporary styled power recliner will easily become your destination of choice to sit and relax after a long day of work. Its high density attached seat and back cushions and over-stuffed pillow arms create a casual comfort with a sink-into padding. An advanced power recline mechanism allows you to kick up your feet at the touch of a button. 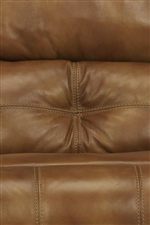 Complete with visible seam stitching and a dramatic center tuft, this powerized recliner will complete your room. The Latitudes - Cruise Control Casual Styled Power Recliner with Decorative Back Tuft by Flexsteel at AHFA in the area. Product availability may vary. Contact us for the most current availability on this product. Arm This collection features comfortable over-stuffed pillow arms. Every home needs furniture that can stylize and standardize comfort. That’s where Latitudes - Cruise Control comes in. This reclining and power reclining upholstery collection offers an abundance of fashion and function with its attached high density cushions, over-stuffed pillow arms, and handsome contrast stitching. Create a cozy seating space with the rocker recliner, love seat, and sofa for a room that will easily become your destination of choice after a long day. Use the exterior or power releases and kick up those feet for even more relaxation. Cruise Control is available in luxurious leather upholstery that is both soft and supple. Unmatched style, comfort, durability, and function can be all yours when you include Cruise Control in your home. 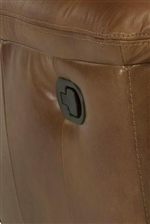 *Inquire with your retailer if special order fabric and leather options are available. The Latitudes - Cruise Control collection is a great option if you are looking for Casual furniture in the area. Browse other items in the Latitudes - Cruise Control collection from AHFA in the area.